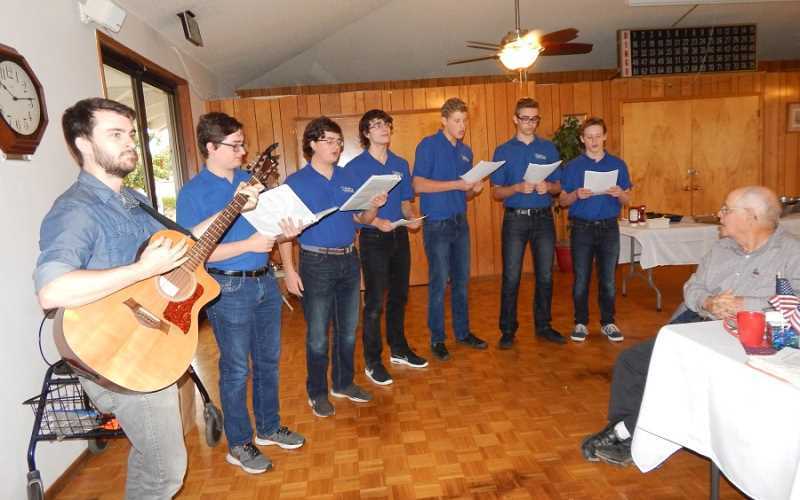 Royal Villas held its Veterans Recognition Breakfast on Nov. 11 with a full program of music, prayer, the recognition of veterans and a history lesson led by Fred Buss. 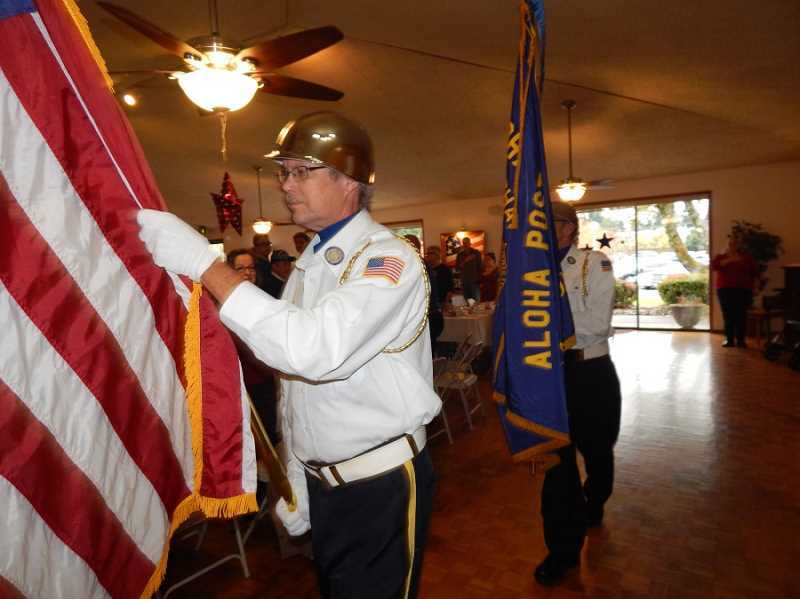 The Aloha American Legion Post 104 Color Guard was again invited to post the colors, and guests recited the pledge of allegiance and sang "Star-Spangled Banner." After a moment of silence, Pastor Don Richard led the gathering in prayer but first told Buss, "I'll take over for you when I move here." Following breakfast, members of the Sherwood-based Voices for the Performing Arts Choir, also called the Keynote Boys, under the direction of Louis Umbarger sang "America the Beautiful" and "This Land Is Our Land." Aaron Richard and Fred Buss recited Johnny Cash's "That Ragged Old Flag" from Cash's 47th album, which is a spoken tribute to patriotism, turning it into a conversation between a youth and an old man. "We had the roll call of our park veterans," said Dottie Buss. "We lost five military members in our community this last year. When Fred called their names, Gary DeRouse rang the bell in their memory. We then sang the first verse of all the service songs. "Fred then reminded us that 'Armistice Day was set aside to remember the end of World War I," she added. World War I battles ended with the signing of the Armistice Agreement at the 11th hour of the 11th day of the 11th month of 1918. In November 1919, President Wilson proclaimed Nov. 11th as the first commemoration of Armistice Day. In 1954, Congress, under President Eisenhower, changed it to Veterans Day to honor veterans of all wars. "Fred then concluded with 'I don't know about others, but I am very proud that I am a veteran,'" Dottie Buss said. "We then sang 'God Bless America.'" Fred Buss then continued, saying, "I'd like to thank John Russie for loaning us the 105-year-old 46-star flag on display today. 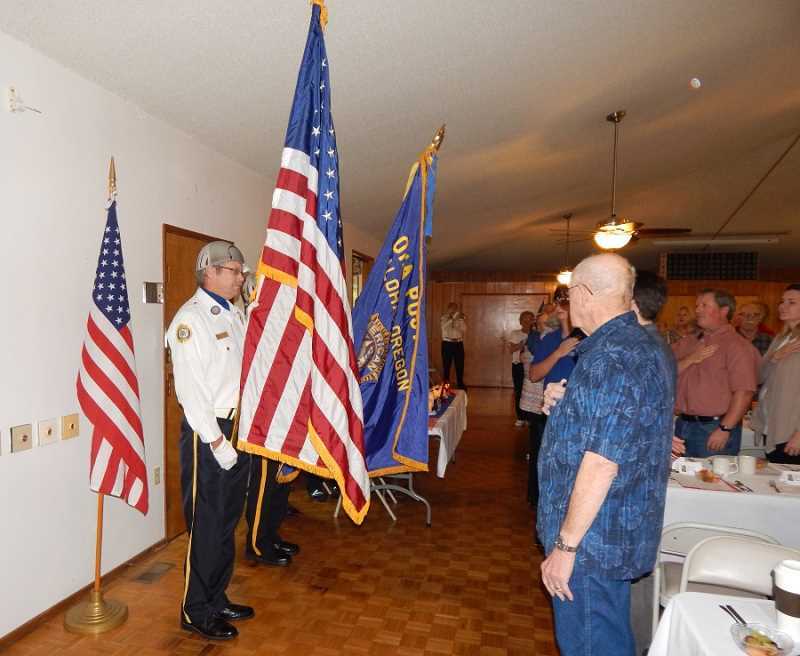 Please join me in thanking American Legion Post 104 from Aloha, Aaron Richard for his part in reading 'That Ragged Old Flag,' our pianist Charlotte Karvia, Pastor Don for his prayer, Rex Olson for the use of his loud voice, today's cooks for the wonderful breakfast, the Activities Committee, my wife Dottie for supporting me, and Louis Umbarger and the Keynote Boys." The Keynote Boys closed the program with an Irish song of farewell.